If you know me (go ahead, the more your see on my blog and at my classes, the more you will!) I adore, love, pin, craft and think about fashion, crafting and pin-ups!! Here is a fun and easy card that is embracing the soon-to-retire stamp and paper collections with the NEW and exciting Blendabilites marker collections. 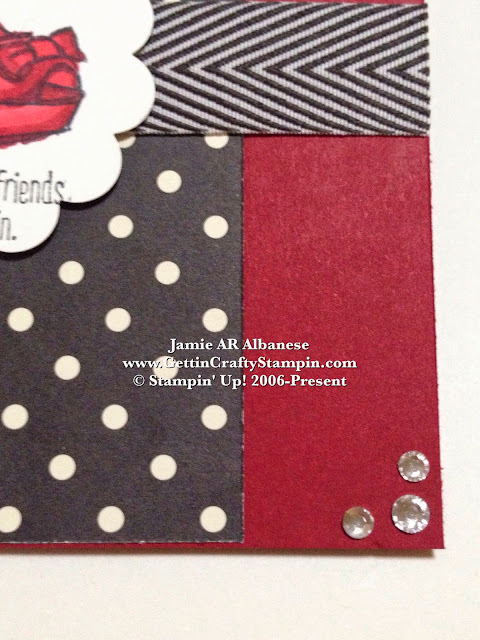 Combine what you love to create a cool card that reflects you! Peep Toes make me so happy - it's silly but true! 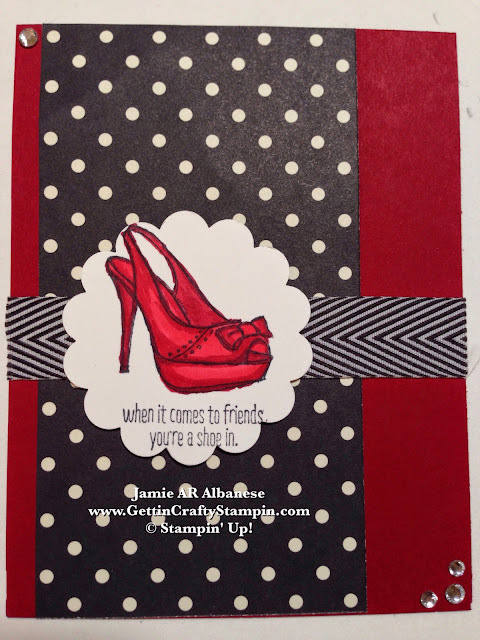 I love a pretty shoe and this Hostess Exclusive, soon-to-retire *Making A Point stamp set is fabulous!! Love, love, looooove it!! 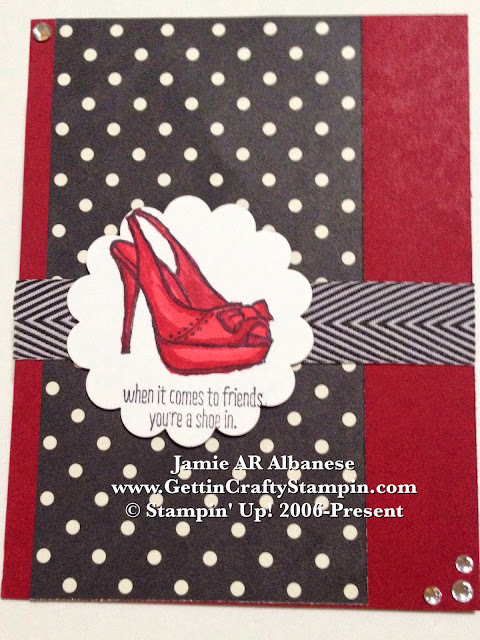 Here stamping it on the Whisper White card stock with the Memento ink pad (a must if using the new Blendabilites markers) I couldn't resist a nod to my love of pin-ups with a pretty Cherry Cobbler red shoe! Framed over this cool, retro Black Chevron ribbon and the soon-to-retire awesome *Modern Medley Designer Series paper, it has a trendy yet vintage vibe to a cool card. Accent the Polka Dot patterned paper and a dash of bling with the adhesive-backed Rhinestone jewels. This is perfect for a fashion loving card!! COMPARE! 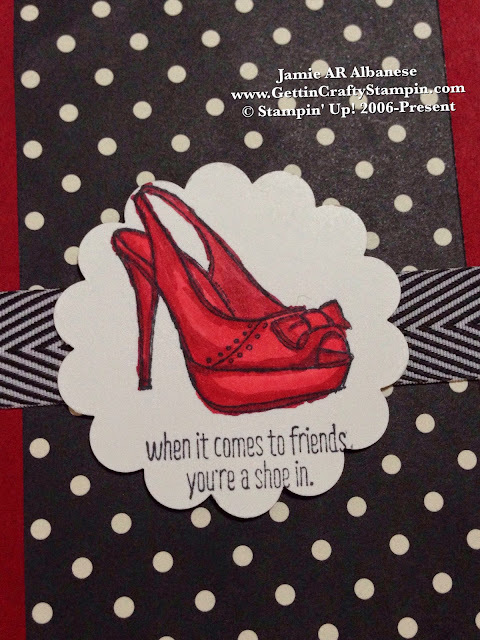 I love our Stampin' Write Markers, they color great and look good. (see the Melon Mambo shoe card) The difference is that it doesn't give the dimension to the image that the new Blendabilites do! I tried to add depth with the Melon Mambo shoe by going over it to do so but the results are not the same. I love that we will have a new option to add to our collections when it comes to coloring for WOW cards. From fashion to crafting, I live a blessed life filled with things that make my heart soar!! 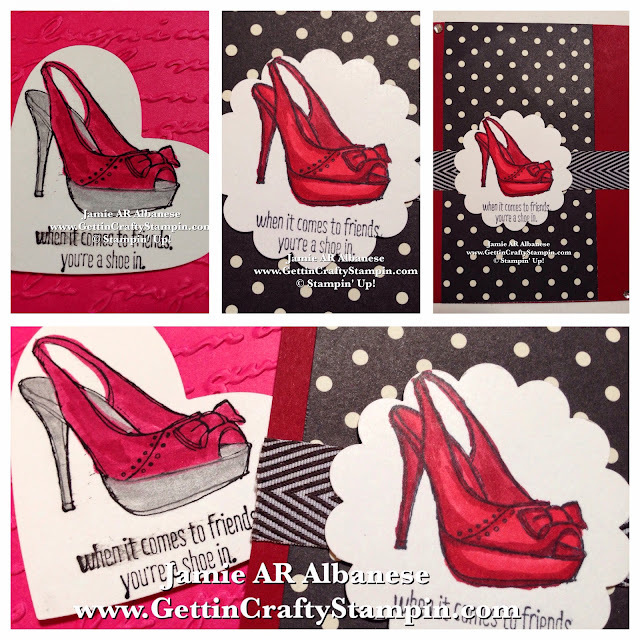 Here a pin-up loving girl can create a fashion inspired card that is super trendy and cool. Grab YOUR soon-to-retire, must-have stamps, papers, accessories and tools as the are ON SALE now! Email me your name and number to receive the New Catalog. Crafting and fashion, two different things that bring me such joy. See how fun it is to mix what you love and create amazing results!